Datums tell us where to measure from. Calling them out clearly and labelling each Feature Control Block with the applicable Datums makes it completely clear how things are to be measured. 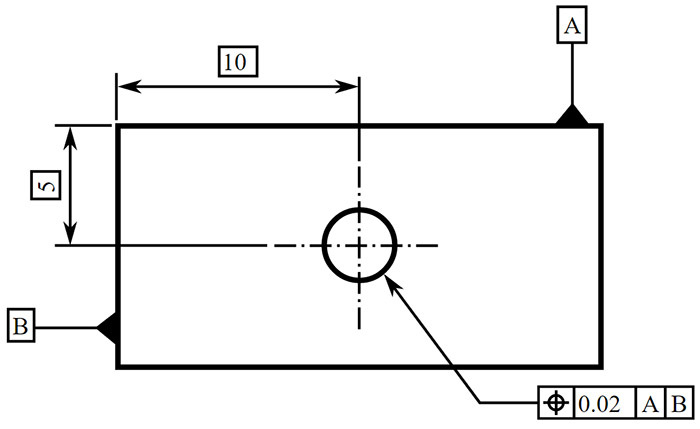 In the drwaing below, A and B are the Datums used to establish the center of the hole using the Position Symbol and the Feature Control Block for the hole center..
GD&T positions every part within a Datum Reference Frame (DRF). Some say the DRF is the most important concept in geometric positioning and tolerancing because it provides the skeleton or frame of reference to which all requirements are connected. For that reason, we want to start early with a solid grounding on Datums and Datum Reference Frames. A Datum is a plane, axis, or point location that GD&T dimensional tolerances are referenced to. Typically, multiple features will be referenced by each datum, so they’re a very important part of the whole thing. Nearly every GD&T symbol except for form tolerances (straightness, flatness, circularity, and cylindricity) can use datums to help specify the geometric control that is needed on the part. 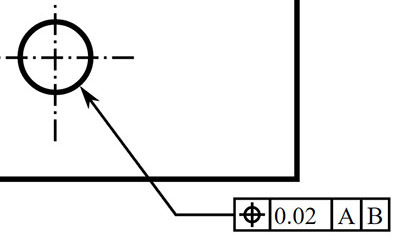 We can place the datum symbol either on the surface or on one extension line from the surface. For any surface other than a round cylinder, the datum is strictly on the side where the symbol is shown. However, for a round cylinder, the datum is the entire round surface. Remember: this places the Datum on the central axis through the feature, not the surface of the feature. Placing the Datum on an axis is common with GD&T symbols that can have axis control like runout, perpendicularity, or concentricity. – It can be placed directly on the hole, as in the leftmost case. It is of course referring to the axis and not the surface of the hole. – It can be placed on the leader pointing to the hole as it is in the middle case. 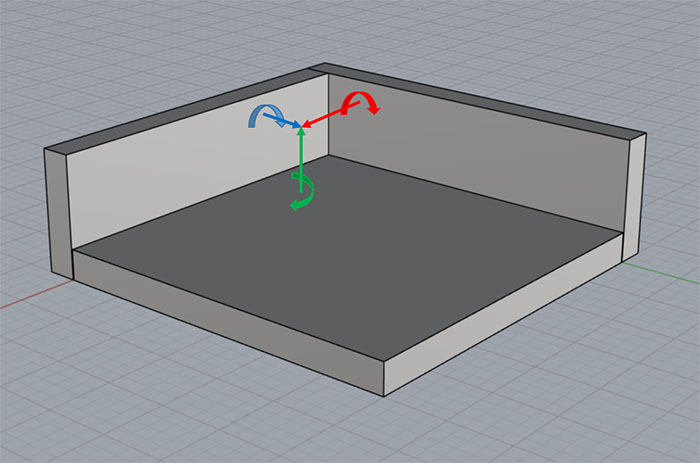 – It can be placed on the Feature Control Frame for the hole. In addition, the datum symbol could be shown on a side view by denoting the axis. At this point it is important to talk about the difference between a Datum and a Datum Feature–they are not the same though it is tempting to refer to them as such at first. Datums are abstract geometrical concepts. They correspond to points, lines, and planes. When we refer to the tangible feature on the part that the Datum is associated with, we call it a Datum Feature. The reason they’re not the same is perhaps small, but significant. It is because real features are never perfect abstract geometrical concepts. Surfaces on parts are not perfectly flat planes. Edges on parts are wavy and are not perfect lines. A Datum Reference Frame is a coordinate system, and preferably it is a Cartesian coordinate system. 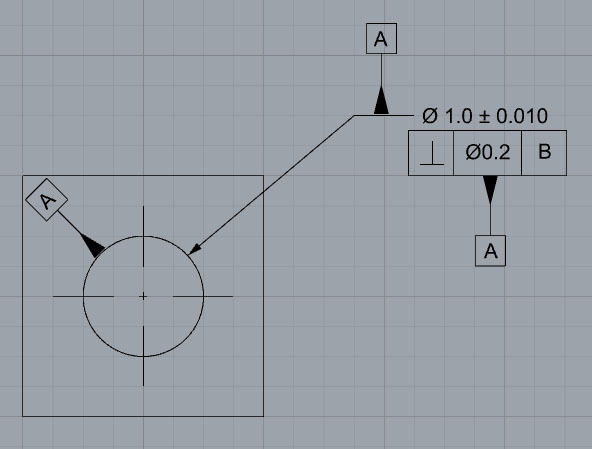 Coordinate systems are valuable because they’re used to locate objects. In GD&T they are used to orient and locate tolerance zones. Controlling 6 degrees of freedom means controlling 3 linear distances from Datum planes to establish an X, Y, and Z position and controlling 3 rotary positions to orient the part at that position. We refer to the translational degrees of freedom as X, Y, and Z and the rotational degrees as u, v, and w.
– The primary datum feature has at least 3 points of contact with its datum plane. – The secondary datum feature has at least 2 points of contact with its datum plane. – The tertiary datum feature has at least one point of contact with its datum plane. The 3-2-1 rule only applies to planer datum features. One may specify a datum feature that is at an angle other than 90 degrees relative to other datum features. These are called Inclined Datum Features. Datum A is the Primary Datum and B is the Secondary Datum. If there had been a third Datum, it would be called the “Tertiary Datum.” It is not necessary to specify the Datums in alphabetical order. Datums are important and care must be taken when selecting them. They must be easily identifiable on the part. When parts are symmetrical or have identical features that make identification of Datum Features difficult, the Datum Features should be physically identified. By now you have an idea of how Datums are shown on drawings and how they’re used to establish a coordinate system. You can read them, at least a little bit, but I’ll bet they still don’t feel obvious and you’re wondering how to “write” them (in other words, how to choose Datum Features on your parts). We’ll have more on exactly how to choose Datum Features shortly. First, we need to talk about Datum Feature Simulators.